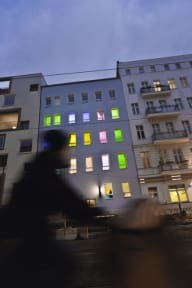 Old Town Hostel i Berlin, Tyskland : Boka nu! The Old Town Hostel opened in 2015. Free WiFi is provided in the building. You will also have access to a shared Kitchen area and a lounge area. Our multilingual staff is looking forward to hosting you for your stay in Berlin. 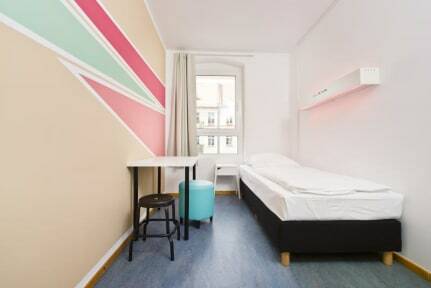 Located in the center of Berlin Prenzlauer Berg, The Old Town Hostel offers accommodation in a neighborhood full of entertainment. Bars, clubs, galleries, cafes, boutique shops are all within walking distance as well as public transport stops for exploring Berlin. Places worth visiting in the area are the Kulturbrauerei, Helmholtzplatz with various cafes, bars and restaurants, and Mauerpark with its famous flea market. Alexanderplatz can be reached within 5 minutes by subway. On three floors we offer 25 private rooms, all with shared bathrooms on each floor. Some of the rooms are equipped with a customizable mood light, allowing you to set the color of the light manually. The reception is open from 8:00 - 22:00 every day, for arrivals outside of these hours, please contact us in advance. We expect our guests to respect people living in the neighborhood and other guests, loud behavior is not tolerated.